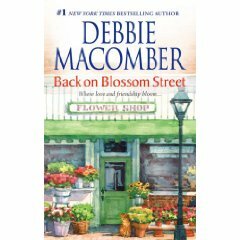 Back on Blossom Street by Debbie Macomber – It's Time to Read! There’s a new shop on Seattle’s Blossom Street– a flower store called Susannah’s Garden, right next door to A Good Yarn. Susannah Nelson, the owner, has just hired a young widow named Colette Blake. A couple of months earlier, Colette had abruptly quit her previous job– after a brief affair with her boss. To her dismay, he’s suddenly begun placing weekly orders for flower arrangements Susannah and Colette both join Lydia Goetz’s new knitting class. Lydia’s previous classes have forged lasting friendships, and this one is no exception. But Lydia and her sister, Margaret, have worries of their own. Margaret’s daughter, Julia, has been the victim of a random carjacking, and the entire family is thrown into emotional chaos. Then there’s Alix Townsend. Her wedding to Jordan Turner is only months away– but she’s not sure she can go through with it. Her love for Jordan isn’t in question; what she can’t handle is the whole wedding extravaganza engineered by her mentor, Jacqueline, with the enthusiastic cooperation of her future mother-in-law. A reception at the country club and hundreds of guests she’s never even met– it’s just not Alix. Like everyone else in Lydia’s knitting class, Alix knows there’s a solution to every problem… and that another woman can usually help you find it. The story follows Lydia, Alix and Colette through family traumas, pregnancy, love and knitting. I found the story similar to The Friday Night Knitting Club by Kate Jacobs in places, yet this did not negatively affect the story. It was very different in places too – such as the wedding and the carjacking. Cancer and people trafficing add a unique depth to the book too. My favourite character was Aunt Elizabeth. She was warm and intuiative. She loved her family and did all she could to keep them safe. She was instantly likable and friendly. A similar character was Grandma Turner. Both were old, wise women who you just fell in love with. I enjoyed the whole book. Although a fairly predictible ending I was gripped and was longing for a happy ending. I will be interested in reading the first books and the fourth books. Pingback: The Shop on Blossom Street by Debbie Macomber « BCF Book Reviews - Love books? Review books!